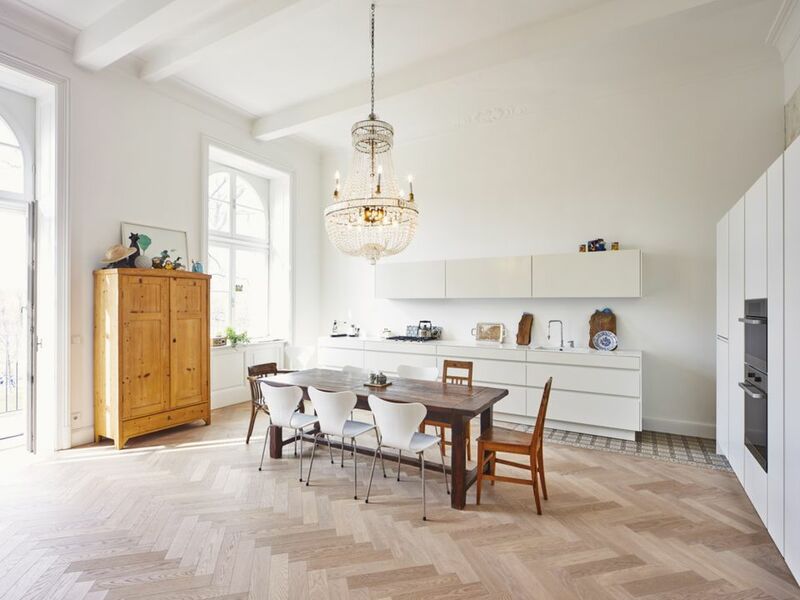 The beauty of parquet flooring comes from the union of naturally beautiful solid wood pieces, with the artistic touch of human design, which takes those earthborn elements and arranges them in patterns of fluid motion. The result is a surface covering that is dynamic and dramatic, while also retaining a reserved demeanor that is perfect for social spaces such as living rooms and dens. Laminate Parquet: This is the most common form of parquet flooring. It consists of slivers of real, solid wood, which are precisely cut down, and then arranged and adhered to a backing material composed of mostly fiber board and filler. This is then covered in a protective wear layer that prevents the majority of spills and stains from affecting the surface. The advantage of these products is that they are produced in discrete tiles, which can easily be fit and placed into a larger application. That makes installation much less complex ​and eliminates some of the errors that can come from incorrect orientation. It also gives you the ability to easily create impressive visual effects in a variety of living room styles. The drawback to laminate parquet is that the material, while less expensive, is also far less durable. The protective wear layer will stop some liquids from penetrating down, however, it will fade over time, leaving the surface vulnerable to discoloration. The sides and backing of these tiles are also susceptible to moisture. In addition, it is impossible to refinish these pieces, limiting the restorative effects that can be produced. Solid Wood: This consists of actual wooden planks, which are nailed down directly to the subfloor. Complex patterns are still possible, but they have to be constructed by hand at the time of installation, making the process very difficult, with lots of room for errors to occur. However many people consider these applications to more vibrant, striking, and visually palpable than their thin veneer counterparts. Solid wood veneers can be stained or painted a variety of colors and will need to be protected with a clear varnish which will both enhance the look of the material, while also protecting it from unsightly blemishes. While these floors tend to be more expensive, one major benefit is that they can be periodically re-finished, sanding down past any existing stains and scars to create a like new surface for a living room. Note: Laminates are easier to take care of short term, but will have wear problems in heavy traffic living room spaces. Solid wood applications will last longer but will have to be cared for with more diligence over the life of the product. There are a variety of products out there that are designed to simulate the look and feel of parquet flooring, while also enjoying a number of functional benefits that can make them more versatile options. Vinyl: The surface of these manufactured materials can be printed to look like nearly anything, allowing for the creation of distinct, precise, parquet effects. That aesthetic is then enhanced by the resilient faculties of the vinyl, which can be paired with padded underlayments, or easily self-installed to create low maintenance living room flooring. Linoleum: This is another resilient material that parquet patterns can easily be printed on for decorative effect. However these products are produced from natural linseed oil extract, making them a much more ecologically friendly option, that doesn’t pose the risk of off-gassing Volatile Organic Chemicals into a living room over time. Bamboo: For a more exotic look, parquet patterns can be comprised of bamboo components, which can add a touch of enchanting allure to the look of the floor. This is best employed in modern and open space zen style decors. Wood Types: The shading, features, and feel of different types of wood can vary greatly, creating a gradient of looks that are available for parquet. The most common species used in the manufacture of these products is oak, although you can also find examples of walnut and redwood incarnations. Finishing Parquet Floors: There are a number of treatments that can be used to color and enhance the look of wood in parquet floors. Some of these will be applied by the manufacturer, although it is possible to get unfinished pieces that you can touch up to your own tastes. Just make sure that a protective clear coat is the last application that goes over the surface, in order to seal in the look that is achieved. Important Note: The application of stain, paint and or polyurethane to an installed floor can cause air pollution in an interior spaces for several days or even weeks after, resulting in breathing problems and headaches. This can be a particular problem in living areas that are often central to the home. Make sure that there is good ventilation during and after the process, including the use of open windows, breathing masks, and shop fans placed in strategic locations. Parquet is easy to take care of as long as water and major stains are avoided. That makes it a popular choice in living rooms, which generally get low traffic and are not often used as eating and drinking environments. Parquet laminates are cheaper than solid wood applications, however, they can both enhance the look of a living room. Alternatives may be able to replicate that aesthetic, but they will still be detectable to touch, which can reveal the deception unless offset by interesting features such as padded underlayment, or textured functionality. Solid and laminate parquet floors are naturally warm, although they do not have good insulation properties, and cannot be combined with most radiant below surface heating solutions. To warm up a living room that features these floors you can make use of throw and area rugs placed liberally throughout the space. It is much easier to repair laminate tiles than solid wood if it is damaged, as pieces can easily be pulled up and substitutes can be put in their place. With planks, each individual sliver effected has to be removed, and new pieces cut to exact sizes then inserted and reinstalled.